It is quite obvious from any outside observer that the Japanese way of life is quite different from that of anywhere else on earth. One of the areas in which this difference has been seen is in male-female relationships, otherwise known as Danjyo Kankei. Some research will yield that Japan was originally said to be a female dominated society, which later transitioned to a male dominated society when Confucianism was introduced through Chinese influences. This influence has existed up until after World War 2 in which the concept of equal rights as well as later feminism were introduced into Japan. However, despite these influences Japan still appears to be a more conservative male oriented society in general. Japanese people typically do not date until later after high school years due to high educational pressures, and if they even marry will not typically do so until their early 30s. 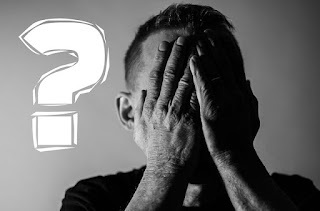 A culmination of cultural norms concerning communication, societal expectations (education, work), and familial pressures seem to make the whole process awkward. In recent times due to a lowering population, changed ideas about sexuality, as well as more women entering the work force, it appears that fewer people are getting married at all. It does not help that a group of men have been labeled as 'herbivore men' for not having any desire for any kind of relationship at all. For those who are interested in relationships often group dating, various dating services, or omiai are considered ways to initiate relationships. 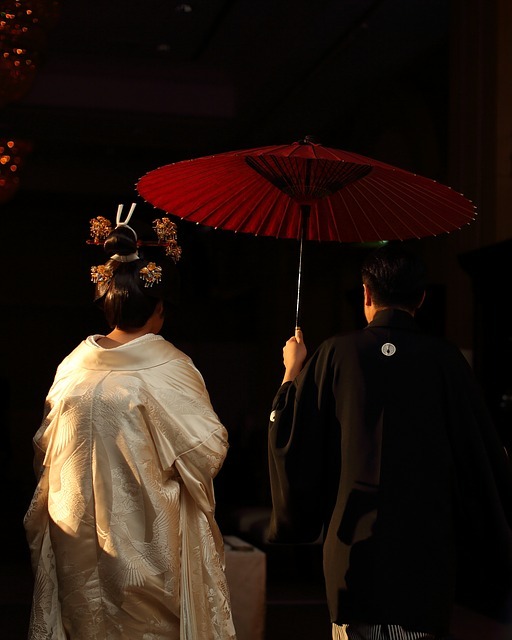 When Japanese do get married the typical scenario is for the man to work many long hours while the woman essentially stays behind to raise children in an almost single-parent style setup. It is expected for the man work long hours, stay out late after work to maintain harmony with his co-workers, and come back very late (past 10pm) at night each day. Often times the woman takes care of the house, children, financial, and spiritual aspects of the home. She can also be expected to be somewhat subservient to her new mother and father-in-law. For these reasons relationships in Japan are often strained, which has led to lowered expectations, affairs, and more room-mate like conditions. Relationships here rarely express affection and often seem to be taken for granted. Perhaps we can now understand one of the reasons as to why the population may be decreasing! What does this mean for ministry purposes? It seems that perhaps with such a low emphasis on relationships that some serious desires for meaning of life as well as reason for relationships ought to be explored in detail. In a materialistic society less emphasis seems to be placed on children or human value in general, while more seems to be placed on the self-fulfilling desires. The Bible gives the solution to the problems Japan is facing in providing a guideline for living, reason to exist, and blessings from God Himself to those willing to follow Him. We should pray for the salvation of the Japanese people as well as direction and purpose! The overall theme of the passage concerns a parable of Jesus talking of how various workers spent their time in service of their master. Living here as a missionary full time now for close to two years has made me understand the gravity the teachings of this parable. In light of the pressures to learn a complex language, the burden of seeing a great mass of lost souls, and the great resources invested into my family to do this work, I can with integrity say that our family has put forth an 'honest work for an honest wage' from our master. A year of work fruitful for the Lord has been far more enjoyable than other years of my life spent on my own foolish pursuits! The following information is for the purpose of understanding the situation here in Japan, so you can pray for it better! 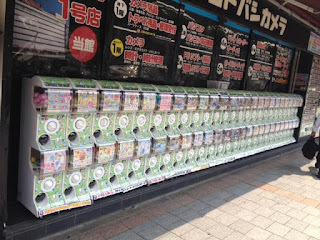 Concerning the gospel tract ministry, in this last year, according to my records, a very conservative estimate of over 70,000 Japanese gospel tracts have been put out around the Tokyo area. Mostly we have been concentrating on apartment complexes as this is where most Japanese people live. Although it is legal to do this, it can seem like a risky venture at times. I have experienced some great protections from God to get into apartment complexes as well as having the exact number of tracts needed to completely cover an apartment complex without prior knowledge of an area on multiple occasions. I have also experienced a lot of hostility and even being yelled at a few times! 'Tracting' can be accomplished by taking about 30 to 45 minutes each day to put out about 250 to 500 tracts on my way to language school early each morning. Many thanks and support need to go to Chick Tracts and Fellowship Tract League for shipping these tracts free of charge. If you want to support a ministry that actually gets good gospel tracts to missionaries around the world for free, please support them! By teaming up with our Japanese friend, we have completed translating two of the Chick tracts relevant to Japan into Japanese. We really can't know what the full results of the tract distribution are, as it is by faith, but my statistics of website views indicate that about 1% to 5% of the tracts put out on any given week will yield a website view. This has also been a year that I have also purposefully focused on reaching English speakers, Vietnamese, Koreans, and Chinese through the use of gospel tracts and websites. Please pray for all these people to become born-again believers and connected to good Bible-believing churches and believers! 70,000 is nothing compared to the 38 million that live here in Tokyo. Please pray for more workers for the harvest! Last January 2018 I was in the middle of a winter session of language school and have been continuing to consistently study ever since. I have gone from having a hard time understanding what was being said to me at all to being able to understand about 30% as well as a great majority of basic communication. Learning a language full-time has taken its toll on us as a family as I am often away studying. However, it is better to put the time in now early on with young children than to struggle later. I have easily put in over 1000 hours of language study this year in addition to the 500 hours from last year. I am in the intermediate level of understanding as of the writing of this blog post. According to some statistics it takes roughly 2200 classroom hours to learn Japanese! Please pray for me as well as my family during this time! Part of a missionary life is being a host to many people. Over the last year we have had many people come visit us from the USA and elsewhere. However, most of our personal ministry also involves having Japanese people over to our house for meals, bible study, and fellowship in general. This includes our teachers, neighbors, classmates, and those we've met through church ministries. 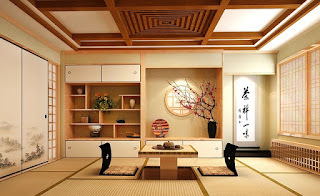 Even though the Japanese culture does not allow for an 'open-house policy' we have maintained our American sentiments by allowing our house to be open to visitors. We have also met with people in public places to discuss spiritual matters in the hope of leading to a Bible study. Much of my wife's ministry has been in meeting with people in public or having them over to the house. Generally we try to focus most of our energy and prayers intently on three main people each to keep matters simple. After reading Master Plan of Evangelism a few years ago we thought it wise to follow Jesus' model in spending most time with three closest disciples. In reality it is easier to focus energy on less people. Over the last year we have been able to get to know people at the church very well. It has been nice to build relationships and gain insight into how a Japanese church operates. As I learn how to speak more it will be good to have this relationship when it comes time to do a new church. Some of the men have become eager to help me learn Japanese as well as knowing about how to help with a new church. The last time this church did a church plant was in 1990, and that church became self-supporting in 2004. My wife has been involved in helping to teach Sunday school as well as doing art projects for the church when needed. We also were asked to be the speakers for the Sunday School mission conference this last year and my wife will be in charge of directing it this year. In relation to the church we have traveled to a few other areas to encourage, as well as to speak and teach in a summer camp. We hope to be able to travel more to see this country in the future when necessary and to put out gospel tracts along the way! I have spent a lot of time talking about 'doing tasks', but I also want to share about 'being'. We have been concentrating on doing daily devotionals whether that be reading/praying together daily or listening to devotionals done by others. This has also been a year of learning about God a lot as I have been able to read a lot on my 45 minute train trips in and out of Tokyo for school as well as watch sermons on the off time. The longer we are here we realize that there is a lot to receive in this humbling process of learning a new culture. We have been able to spend some time together as a family, which has been nice. Please pray for us to be strong as a family as we are finishing up year two. On average missionaries quit japan after about two years! 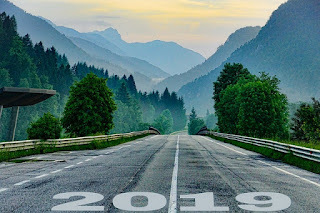 This year has been a good one and we thank first and foremost the Lord Jesus Christ followed by our supporters who have generously allowed us to be here to represent the Lord. We look forward to the next year as well as a new baby to be due in late June! We want to publicly thank everyone for their prayers, support, and encouragement! God Bless! Many of you have not seen a lot of the pictures that we share on Facebook, so I decided to post some here. Please enjoy! small fish, etc. 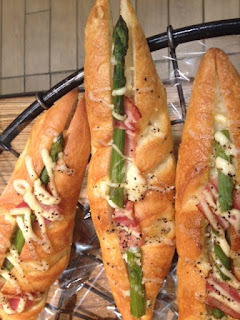 included with bread. Some popular breads are also hotdogs and buns with spaghetti on them, which are both left out in the cold. This is one of the bullet trains that can be found around Tokyo. They travel at a top speed of about 200 miles per hour. On board it is a very smooth ride. They are about equal in price to a domestic airplane ticket. This is an "Ema", or a Shinto prayer request poster. 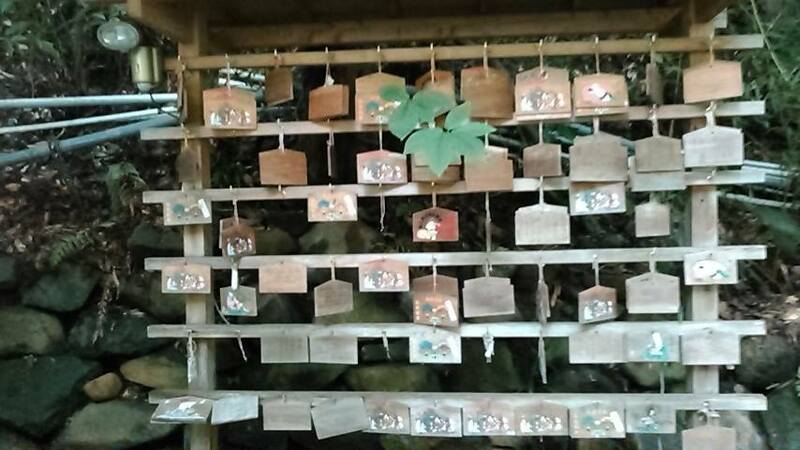 Basically people write their pray-requests on a piece of wood and hang it here in the hopes that a spirit will see and answer it. 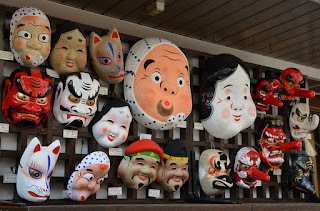 They are common around Shinto shrine areas. This is a Gacha Gacha toy machine. They are all around Japan because Japanese people love miniature things. Here is a detailed video on it: ( https://www.youtube.com/watch?v=7b9xoU0cy28 ) Just like in many American grocery stores you can buy these cheap toys in a plastic bubble for anywhere from $1 to $5. Japanese people love miniature things. This was a miniature bike that I got permission to take a picture of. 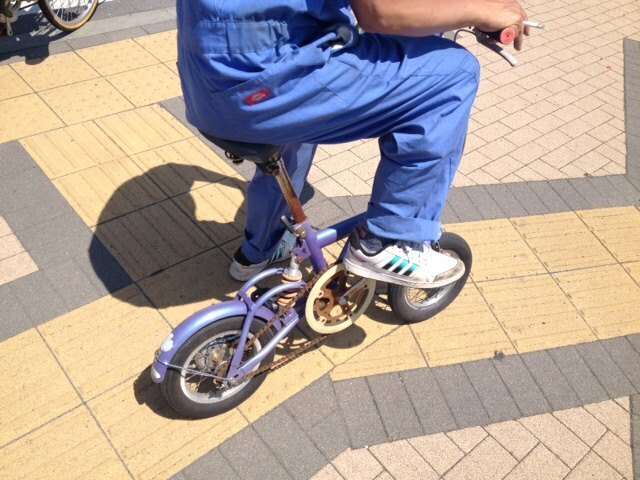 It was kind of funny seeing a tough guy with a cigarette and a tiny bike! 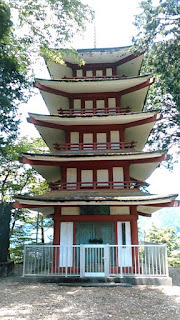 In Japan in special places Pagodas can often be found. 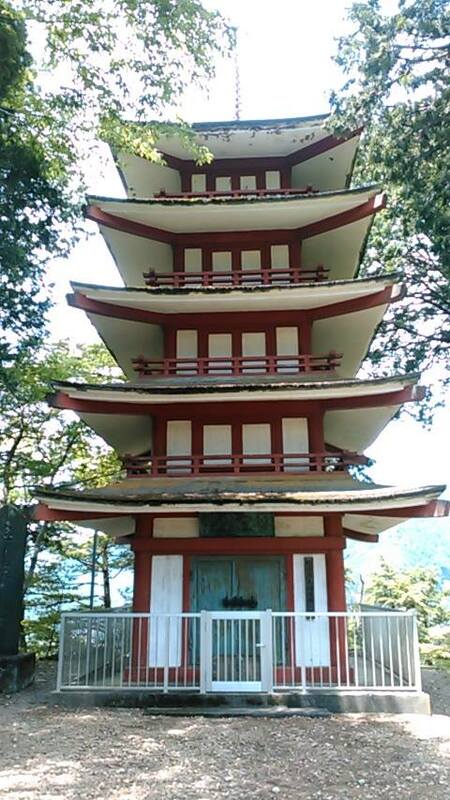 This particular Pagoda was on top of a mountain in the Okutama City area. It was certainly unexpected. We basically came upon it at the last second on top of a mountain. I did not even know that it was going to be there. Japanese like to build shrines, temples, and pagodas on top of high places. In the Bible in the Old Testament when I think of 'high places' that were used to worship pagan gods, I often think of the same thing here in Japan in their high places. 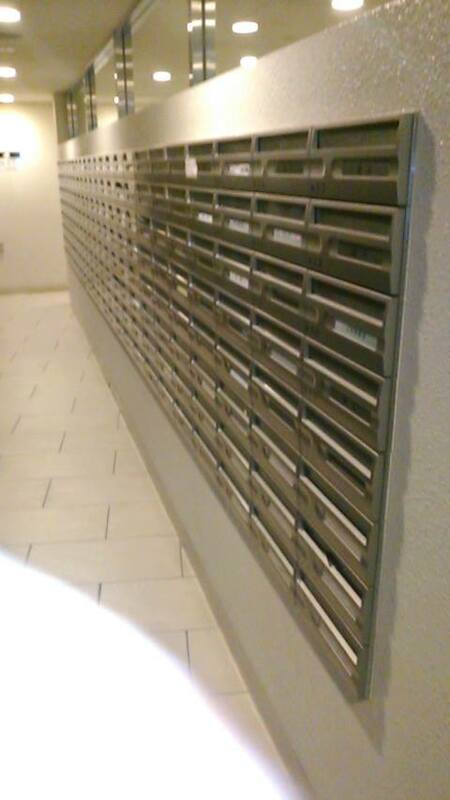 This is an average apartment mailbox. Most Japanese people live in 'Mansion Apartments' which are huge flats with hundreds of rooms. This particular apartment had 500 separate rooms in it. Whenever I talk about putting out 250 gospel tracts a day, these are the types of places that I go. This particular apartment took me two separate trips to completely fill up. 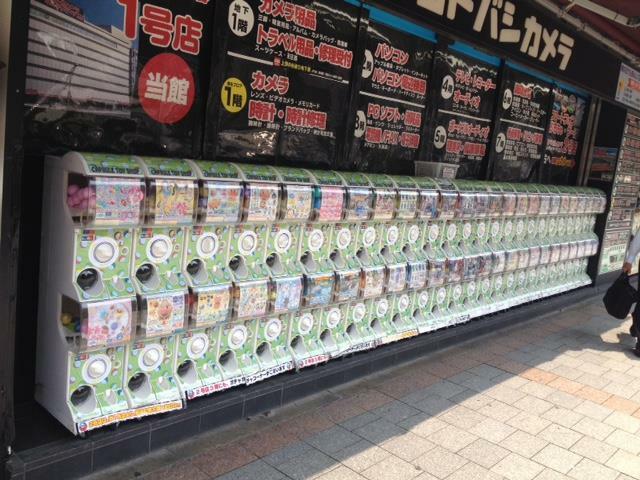 Tokyo has millions of people, so it is quite easy to put out hundreds of tracts each day. To day I have put out close to 70,000 tracts in apartments. (These don't count the ones that I hand out in person, or leave in places.) In Tokyo there are about 40 million people, so I have barely dented the population with basic gospel tract coverage. Usually about 1-5% of people will actually read the website on the back of the gospel tracts. The website has youtube videos and websites about Christianity, God, Salvation, Evolution, and good churches. Please pray for those people who are interested to be saved and connected with a good Bible believing church! This was an unusual treat to see. 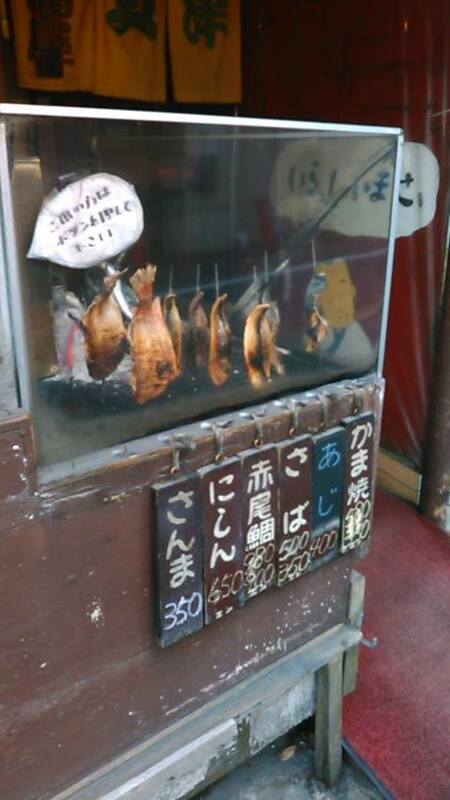 These are salted roasted fish for about $3 to $5 dollars. A traditional Japanese snack indeed. Throughout Tokyo there are many traditional type foods and stands to sell to passersby. One of the neat things about being in a large city area is to see the great varieties of foods. This is a Buddhist shrine that is close to where we live. 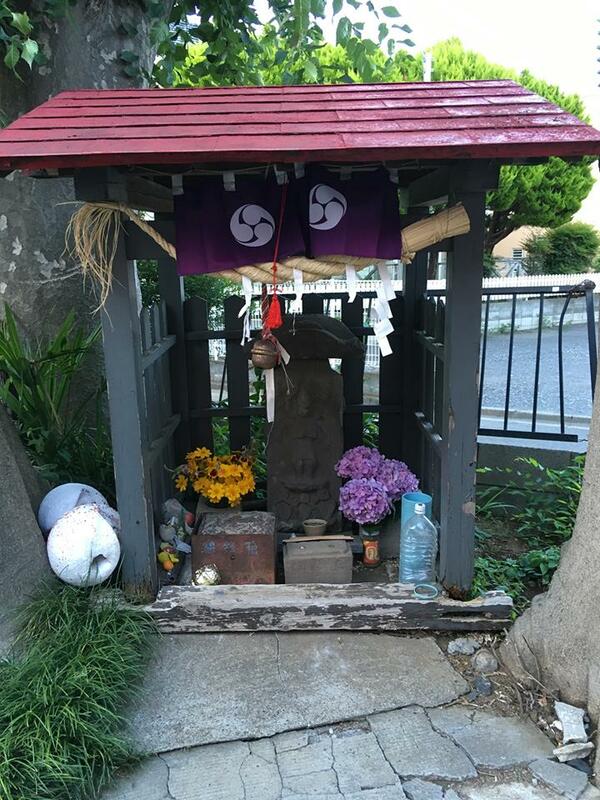 In Japan practically every street corner has some kind of a Buddhist or Shinto shrine. They are deeply embedded into the local culture. We often see people praying at this particular shrine in the morning. They will pray, ring a bell, and throw a coin in. Often times they pray for prosperity and health. Their idea of God is more of a mysterious energy, rather than a personal loving God. Most people do not actually believe in Buddhism or Shintoism when asked. They just follow these traditions because their ancestors followed these traditions. Nonetheless they are strongly influential upon their souls as they are dedicated multiple times in Shinto temples throughout their childhood. This is the famous "squatty potty". For the Westerner this is highly unusual. If you ever go to Asia you will see them. (Probably some ares in Europe too!) 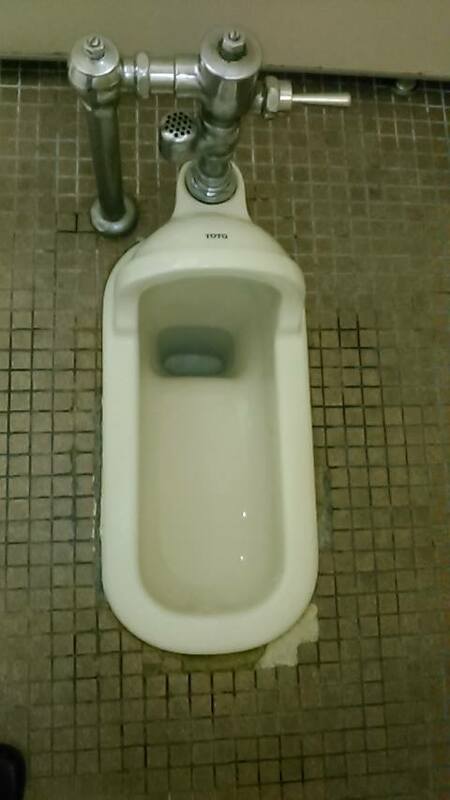 You basically stand and squat over the front part near the flushing handle. It requires a lot of balancing to do correctly. As Americans we could probably not imagine an older person trying this, but in Japan it is quite common as the people here are very limber. 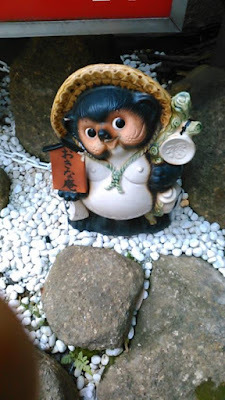 This is a Tanuki. They are considered to be good luck animals that can also be mischievous. They are basically a unique raccoon - dog type animal that exists here in Japan. Often these little statues are seen outside of restaurants. Japanese people love to make small statues of various animals and people to place around gardens, houses, and public areas. Finally, this is a picture of a wheat harvest happening right in the middle of an urban neighborhood. 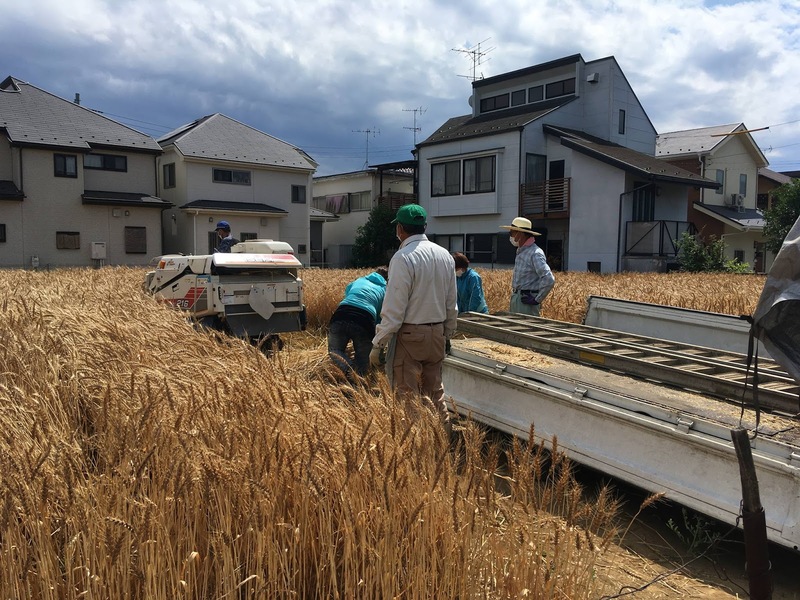 In Tokyo the Japanese people make the best use of the small bits of land that they have to plant various crops! Now in raising a child in Japan my wife and I have been exposed to various Japanese children's stories and books. This has led to our exposure to Otogibanashi, or Japanese Folk Tales. Each story can reveal the influences on the Japanese people from Shintoism, Buddhism, Confucianism, as well as other traditional thoughts. Often it is thought that a nations folk stories for children are meant to teach morals and values important to those people. What are the main differences between Japanese and Western stories? If you read some of the Otogibanashi from the previously linked website, you will see some of these common themes: importance of the group, strong value of nature, and ideal morals to be practiced. For instance Japanese stories often focus on modesty as opposed to pride, inward beauty as opposed to outward beauty, dependence as opposed to independence, and acceptance as opposed to rejection. These values from the Otogibanashi reinforce what children learn from Japanese society as being either acceptable or unacceptable. If you are into reading manga or watching anime you will most certainly notice many Japanese cultural motifs that may influence you whether you notice it or not! This kind of cultural soft power has influenced many people around the world to be highly favorable toward Japan and to actually move here. Although some of the values in folk tales are favorable, some of them are not. No matter which country we live in, we must be discerning of what exactly is being taught to our children. For instance, in America the mainstream entertainment industry specifically geared toward children always seems to influence thought based upon some kind of agenda. Often times those values are the opposite of Biblical values, and are therefore governed by the ways of the world. As is in the case of any type of media we consume, we must be highly discerning as to what is being taught to our children. Does it line up with Biblical values? Are you willing to see if your influences line up to the word of God? Please pray for us as we seek to find a balance between what is acceptable and what is unacceptable for raising children in this culture. If that link does not work where you are at you can always try to look up “Begin Japanology” on YouTube. If you have the time, please watch some of these episodes to better understand Japan. By watching this TV show you will be able to better pray for the Japanese people as well as understand missionary work in this country! In Japan high emphasis in daily life is traditionally placed upon the virtue of modesty. This concept is known as Kenkyo. Because Japan is a 'vertical society' it is important to know what your role is and how it works out in society. An important way to demonstrate an understanding of society is by being careful in the use of communication with others. Hence, the importance of modesty! In the Japanese language a whole subset of special words as well as grammatical forms are employed for use when speaking with superiors to demonstrate modesty. This subset is known as Keigo and is used extensively in the business world as well as when speaking with one's elders! Knowing how to use the correct expressions in Japanese society becomes very important. 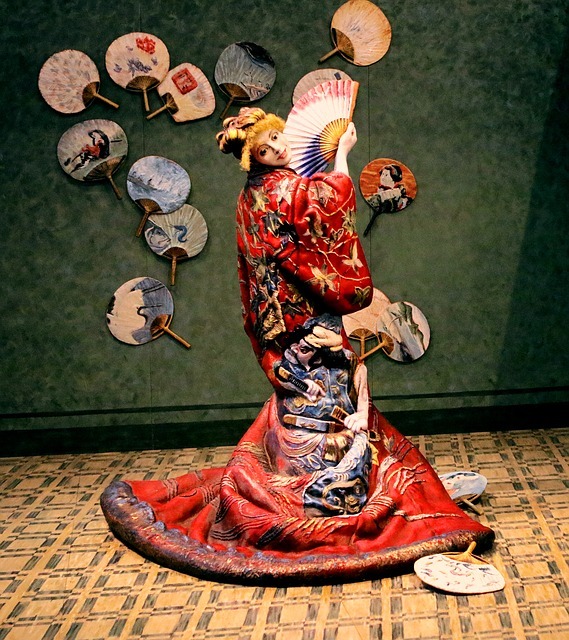 To demonstrate ones modesty by downplaying compliments or deflecting conversations away from oneself becomes a carefully orchestrated “dance” here. In the West this may seem silly or really overdoing the formalities, but here in Japan it is seen as necessary to show humility. Interestingly enough, in Japan this kind of passive or overly polite behavior is seen as a great virtue. Those who are humble, quiet, obedient, unquestioning to authority, and compliant are greatly valued here. (Although that is changing somewhat with new generations.) Whereas in America the opposite is true! Can you see how politics or businesses would clash when East meets West? How does this value impact ministry? Since Japanese people value great modesty they can appreciate that the same virtues are taught by Christianity in the Bible. For this reason many Japanese respect Christians even if they do not want to become a Christian. The great truth of Christianity is that God can transform the inner man through salvation, which leads to true humility. Inward humility from a sincere motive truly comes from God. 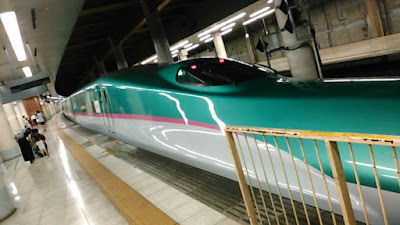 Often times Japanese are taught to be humble outwardly because it is required of society lest they be shamed, however it does not necessarily mean that they are humble people in reality. Often times visitors become disappointed to find out that the humility here is just an act. As Christians we know that only the inward heart change can truly change a person. Once a Japanese person realizes that, they are free to 'be themselves'. In the West we have no idea how much pressure can be exerted on a person to act a certain way because society demands it since we are so used to freely being able to express ourselves. Unfortunately, in the West our freedom often leads to various sins and crimes. Although modesty is a great virtue practiced here in Japan, it comes at the cost of sincerity often times as it is the product of forced compliance from fear of shame or dishonor. Please pray that true freedom in Christ can be found by these people! Currently in Japan there has been a wave of potentially dangerous natural events with heavy rains and floods in the west to new heatwaves in the east. These events have led to many emergencies as well as deaths. All around the world when natural disasters occur death counts usually accompany them. However, when was the last time you heard of so many dying from a heat wave? 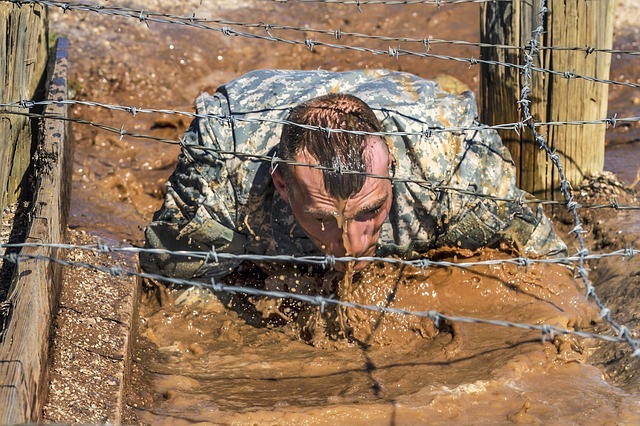 Normally a few elderly are affected by heat waves, however have you heard of 10,000 going to the hospital concerning heat in such a short period of time? Perhaps there is another explanation for this contained within Japanese culture. Deep within the Japanese sentiment comes the idea of enduring unbearable difficulties, otherwise known as “Gaman”. In American culture we have a similar concept in the saying, “No pain, no gain.” However, in Japan it is proudly taken a step further in coordination with the overall group culture. It is expected to endure intense difficulties, rather than bother the group with your individual “weaknesses”. In the business world this is seen with enduring poor treatment or long hours as somehow contributing to the overall strength of the company. In a house for the sake of the country a person will often “Gaman” by not using the air conditioning in order to save power. This kind of stoic self-sacrifice is very much a Buddhist cultural trait akin to the ideal lifestyle of a monk: “Work harder, eat less, control the self.” Throughout Japan's history this sentiment has defined the people as they frequently endured hardships for the sake of achieving their nation's gradual milestones into becoming a first world country. In modern times within the Japanese sentiment also exists the idea of having no wastefulness, otherwise known as “Mottainai”. Because of the great sacrifice it takes to produce things in society there is a strong sense to not waste anything. Japanese people tend to be a highly frugal people. Coupled with their sense of identifying with nature they strongly desire to be as frugal as possible in society at large given that many people live on the small island with limited resources. This is truly "going green". Japanese also tend to strongly believe that global warming is a reality, and that they must do something about it. Therefore, the wasting of energy is seen as a great societal sin. From leaving lights on unnecessarily, to driving a car too much, to using air conditioning – many Japanese desire strongly to avoid wasting resources. Together with Gaman and Mottainai comes the belief that we can change the planet through our own strength, and that our individual value is low compared with the greater good. Perhaps now you can see why when natural disasters occur that people do not want to trouble others, or when a heat wave happens many health issues arise when people insist on enduring! Certainly these are admirable attributes that we can learn from, but sometimes we must ask ourselves is the stoicism worth it? In a society with no real concept of grace or forgiveness these attributes of Gaman and Mottainai are man's alternative. They are noble and highly admirable in the sight of men, however potentially come at great human cost. What is the value of a life? As a Christian, the value of one soul is great as seen in the parable of the lost sheep found in Luke 15:3-7 . While it is sometimes reasonable to endure hardship as well as to be frugal, it is not the ultimate truth! Please pray that Japanese people would be awakened to their need for God reliance! Welcome to Japan. Avoid shame to your country, town, family, and self. The pride of your country, town, family, and self must be preserved! Humble yourself before your superiors to show them reverence! Although not spoken outwardly, this very deeply ingrained life-blood of Japan (as well as much of East Asia) is known as “Saving Face”. This has been described as the “air” in which Japanese people breathe and live in. Since the group understanding is valued greatly it also follows that social standing within that group is highly important. To humble yourself before another causes their social status to increase, while causing shame to others causes them to be viewed negatively in eyes of others therefore lowering their status. In Japan this is extremely important in everyday interactions. So important that at times in the past one would rather starve than to injure pride and cause the losing of face. Although not as radical today, a strong element of face saving is firmly planted into the soul of every Japanese person. How? Rather than hurt the personal pride of another person it is more safe to remain silent, ignore issues, or lie. This is seen as protecting the dignity of another, while preserving your own standing with that person. For instance when asking someone for directions, they would rather tell you the wrong way than tell you that they do not know, since that would be embarrassing to them! For Westerners, especially Americans, this is unacceptable. We are accustomed to speaking openly and honestly with people while letting feelings come second. Because of this we can be blind to the realities of everyday situations here. Japanese may be afraid of Westerners as well since they do not want to be potentially shamed in public. (What if I don't know the answer to their question? What if my English is no good? What if they really did mean to order that bowl of broth with no noodles?) As Westerners we may not have a clue that we are actually causing people great shame because they will never say it or admit it openly since that would cause us shame! So, if a relationship suddenly ends there may be a reason why that happened without warning! Only by understanding the culture can a more acceptable approach to communication be taken here. How does this play into ministry? In many ways Christianity always emphasizes open and honest communication. This can be another reason why Japanese think it to be a foreign religion as its emphasis on communication is so different. In reality Christianity helps Japanese people to look outside of themselves and their world to realize that there is more to this life offered by God. Some that experience living in the West long enough among loving Christians will experience this freedom given by God. Many Japanese tell us that they feel judged by other Japanese because of the standards set by society having to saving face. One thing is certain, the saving of face here contributes to a lengthier time period needed to invest into people in order to have good communication with them. Because of this process it takes longer to gain trust, and few close friendships are established. The friends gained however are very loyal. With saving face it is always difficult to tell if people genuinely want to study the Bible or if they are doing so because we are 'the sensei' that is to be respected. For these reasons as well as others the work here is certainly a slow and steady one. Few risks are taken in ministry here because of the potential backlash against an already sensitive system that will not allow disagreement with ancient norms. However on the positive side, with the right heart behind it, the saving of face is a powerful means of showing true love and respect to another person. Whether it be showing genuine appreciation, protecting others from shame, or the giving of gifts there can also be much to be thankful for. All in all the saving of face forces people carefully think about their interactions with one another whether or not their heart is in the right place. In the West in general we could probably use some of this respectful sentiment in our interactions with each other! After reading these Japan Culture Series blogs for quite awhile now you may have come to the realization that in almost every way Japanese culture appears to be the opposite of Western culture. Perhaps one of the areas in which a stark contrast exists the most is in child rearing practices otherwise known as Ikuji. Raising our child here in Japan has certainly been a learning experience in that as an American we tend to focus on individual values (independent decision making, creativity, etc.) and discipline (direct communication, yes/no), whereas the Japanese way focuses primarily on the feelings of the immediate group and larger society. As Americans we tend to place a lot of emphasis on direct verbal communication for instruction (do what I say), while Japanese tend to follow by example and the actions of non-verbal communication (do what I do). In this way Japanese children gradually learn to be aware of what others are feeling or thinking, and to adjust their behavior accordingly. Japanese children are given a great amount of freedom to behave as they like until they gradually realize through observation of others that their behavior is not accepted and eventually need to conform to the group standard, whereas American children are typically told verbally by their parents that their behavior is wrong and that they need to stop immediately. 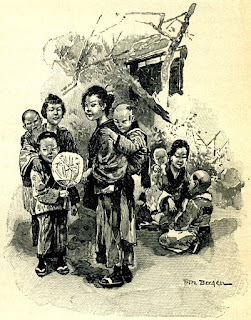 An ideal child in Japan is one who is well-mannered in group relations as well as obedient to the group expectations, whereas an idea child in America is seen as one that can think for themselves and communicate directly. In this way Japanese people tend to see what the group thinks or does and listen rather than give their own opinions, which may disrupt the group harmony. Here in Japan it is clear that other people and society come before the individual opinion. Each way of raising a child has its benefits and detriments. Some difficulties for American parents occur when their children become too demanding, assertive, and self-centered. Some of the difficulties for Japanese children are that they have a difficult time thinking outside of the group or giving their own opinion of anything. Certainly a balanced approach is ideal in which truth in open communication as well as harmony with others is emphasized. As Christians when raising children we emphasize not necessarily what others think as the most important thing in life (or even our own will), but what God thinks. Our behavior is to be governed by God-centered principles as opposed to man-centered individualistic or group-oriented thinking. Rather than teaching a child that something is wrong because the group does not like it, or only because “I said so”, we operate on the premise that it is because it is wrong in the sight of God. As Japanese become more influenced by Western thought, and as Americans become more influenced by post-modern group thinking we need to remember that Godly biblical principles ought to govern our approach to life no matter where we are from! In the social composition of the Japanese being exists the very real conflict between social obligation and personal feelings. These personal feelings are known as Ninjō. In an earlier blog here. I spoke of social obligation, otherwise known as giri. This social obligation plays such a strong role in Japanese culture that it is often expected that one yield personal desires and feelings to it unquestioningly. However, this does not mean that personal feelings are absent. For example Japanese employees are expected to provide excellent service to customers even when treated very poorly. The honor of the company as well as the duty of the individual are at stake, so the insults must be taken. Whereas in the Western world a insult by a customer may or may not be taken so kindly; company or not! We may now understand how pressure could easily build up within each person as they continually deny themselves in order to fulfill social obligations. 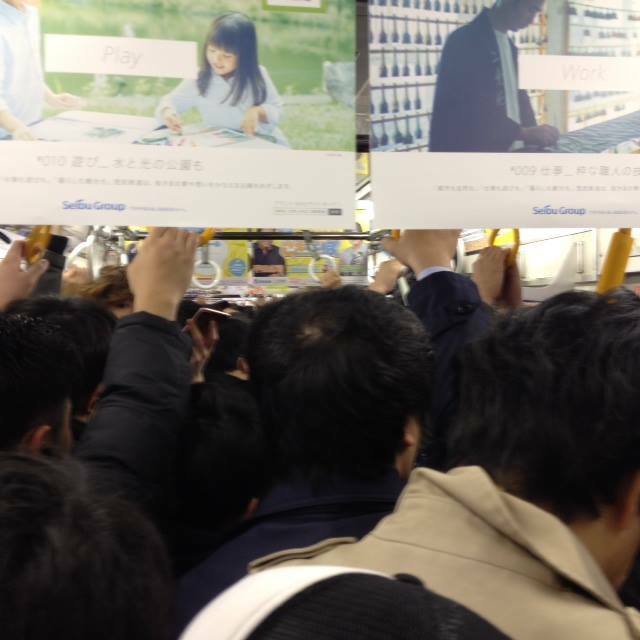 Perhaps this is one reason why Japanese life can be stressful. To an extent no matter where we are at in our lives we all deal with certain social obligations. However in Japan social obligation has been taken to a high degree as they have been integrated into every aspect of life. This especially becomes painfully obvious to the newly born-again Christian when trying to live every day life here. There are great expectations to conform to religious ceremonies, work obligations, and other various activities – which can bring great conflicts within the Christian conscience. What happens when in order to keep your job it is expected to drink after work every night? What happens when the school requires your child to do something against their beliefs? What do you do when your family pressures you into breaking your convictions? These are all real pressures that Japanese Christians face in a strong group oriented society. By default these brave men and women have to 'Dare to be a Daniel'. Perhaps this is why few here choose to become Christians, or are very quiet about telling anyone that they are a Christian. In reality no matter where we live in the world we have to make a decision to either go along with the world or to oppose it. We must ask ourselves if we are going to be of the world or in the world witnessing to it of Christ. May God grant us the resolve to live a Christ-honoring life!